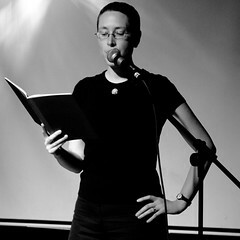 Audition at the Wee Red Gig in November 2010, with “Form Follows Foretelling”, a story of architecture and tentacles. Read “Power of Scotland” at Love Sick in February 2011. You’ll also find the story in the anthology ImagiNation: Stories of Scotland’s Future , edited by Gerry Hassan and Bryan Beattie. Read “Banana Republic” at Mr Big Society in June 2011. It’s the one with the monkeys. Write and produce “Living Silver” for Electric Lit Orchestra at the 2011 Edinburgh International Book Festival. Andrew J. Wilson did the reading, and a stealth choir in the audience sung their hearts out for the finale. Read “Ms Chalmers and the Silent Service” at Brave New Words in the 2012 Edinburgh International Science Festival. More tentacles, this time paired with submarines. Photo: Banana Republic – Helen Jackson by SK51, on Flickr.